I’ve mentioned before my quest to become Ms. Suzy Homemaker. Not really, but I certainly feel that way now that I’m learning to crochet and knit. Yesterday, we were at Michael’s (a craft store) to pick up some yarn for my newest project. While in the yarn aisle, Whitney (our 8yr old) looks at me and says, “Mom, where can you buy chopsticks?” I asked her why she needed chopsticks. (Especially considering that we have never consumed Chinese food in our home nor have we ever used chopsticks in any restaurant we’ve ever been to.) She explained that chopsticks are needed for knitting. I had to keep from laughing as I knew she was completely serious and was a bit on edge at that moment from an issue with her brother earlier. 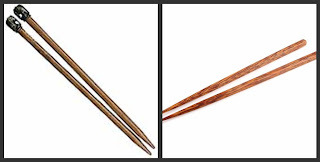 I simply took her over to the “chopstick” aisle and explained that they were called knitting needles when they were used for knitting and chopsticks when used for eating. I’m waiting for the day when she tries to use her knitting needles for eating Chinese food. Smart girl -- I see how they could be easily confused. On another note, how could you not ever eat Chinese food in your home? ( could see not making Chinese food (even though eggrolls are about the easiest and cheapest food to prepare), but not even takeout? I'm impressed. I'm surprised my kids didn't ask the same question. Earlier I heard my 6 yr old telling her 5 yr old sister that she bought some "jellyfish" to put on bread. I don't know how grape jelly turned into jellyfish, but the 5 yr old was not deterred from trying it too. I can see why one would make that mistake (LOL). Actually she's right on. You can knit with chopsticks. Check this out!